Written by Sasha Hanic from In The Deep Swim School, Sydney. Why do we enrol our kids into swimming lessons? Is it just for safety and survival? Sure, this is a base-level need. What about lifestyle, fun and enjoyment? I suspect this is really what we want to give our children. Going from danger to belonging! From nerves to pure joy! The water should bring us all pleasure and adventure. And this can only come from skill. When we teach children a skill in their swimming lessons, we’re always thinking about their long-term relationship with the water. We want a child to be relaxed in the water, from their infant classes through to becoming a squad swimmer, so that in any situation in their lives to come, they can survive, feel safe, and more importantly, love the water and see it as a source of fun and relaxation, not one of stress and fear. Feeling relaxed in the pool is a completely different experience to feeling relaxed in open, rougher water down at the beach! While we’re all flocking to the coast this summer, exploring the magical rock pools, bogey holes, ocean pools and beaches, we’re presented with an opportunity to share our coastal lives with our little ones in a different water environment. Thankfully here in the eastern suburbs, we have so many choices and safe options when we introduce and continue to explore the ocean with our kids. Some kids will dive in with open arms and love being tumbled by waves and the adrenaline it gives them. Some kids will feel completely overwhelmed and out of control. It’s important to remember we’re all unique and will experience and react to water differently, but nevertheless, let’s just keep dipping our toes in the water! Skills that we learn in our structured lesson environment will be enhanced from unstructured play. We need to give children opportunities to recall things they’ve learnt and make decisions on their own. In lessons, kids are guided by a teacher and given clear instructions. They need to have time to then take this information away and process it with no instruction. When to do what, experiment, even make mistakes. This experience will have them soak up more information upon their next swimming lesson, being able to put into context what they’re learning and how it might apply in the ‘real world’. Having a chance to use skills children have learnt in lessons will, of course, give them more opportunity to practice, however, even more important is using skills in a different environment all together ? Holding our breath under a wave, just like using our ‘puffer face’ skills from Yellow Tails. Diving under a wave, we can duck dive or rocket dive just like in Red Tails. When we need to relax, we can float on our backs — which is much easier in salt water! Learning to catch a wave using our push and glide skills from Red Tails. 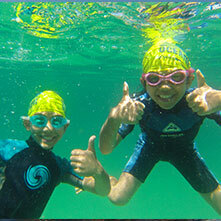 Even our mini squad kids can do some ‘secret arm’ butterfly when heading out into the surf! The more exposed we are to an environment such as rough water, the less anxious we will be, and the more confident we’ll become. For children that may take some time, and that’s ok. Take it slow, let them go at their own pace. But never stop jumping over waves until they are ready to go under, never stop catching the whitewash until they are ready for some greener waves. If we get scared, that’s ok! It’s all part of learning to let go of our fears and embrace and love the water, for it to turn into our happy place. Our role as teachers and parents is to encourage, empower and guide our kids to grow, learn and overcome things, to take a hold of life, celebrate their achievements and gift them the skills to not just survive, but thrive in the water. If you want to be strong and confident swimming in the ocean, it all starts with being a strong and confident swimmer.